A toolbar in an internet browser’s crucial; it’s what makes navigating and personalization efficient and much easier as opposed to hiding the toolbar and/or accessing various option via right-clicking. But, like with everything else, the toolbar has its downs. First and foremost, the toolbar can get in the way of what you’re working on or viewing within the browser. By hiding the toolbar, you can see more of what you’re viewing or working on. Some people just prefer to hide the toolbar and unhide it as desired or needed. While toolbars may be essential to regular internet surfing, there are some that are installed via malware or unrecognizable sources. There’s a way of getting rid of a toolbar, whether it’s due to such or you simply don’t want a certain one. 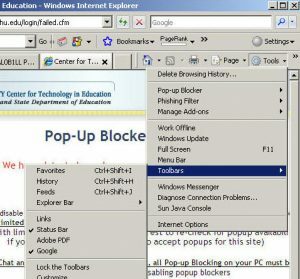 Nowadays, a list of toolbars that are apparently installed in your PC can be accessed in your browser by clicking on the cog (Internet Explorer) or orange rectangle labeled “Firefox.” Universally, toolbars are known as “add-ons.” Respectively, there’s a “Manage Add-ons” option that you can access within your browser. For Google Chrome users, you may find installed toolbars in the tool>extensions>settings section. When you find the list of installed toolbars, select or highlight the ones you don’t want and either click “x,” “uninstall,” or the trash can icon. As mentioned earlier, toolbars can be installed without you knowing it. If you don’t recall downloading and installing a certain toolbar or two, then chances are it could be an infestation. Scan your entire PC using Malware Bytes to detect and remove potentially harmful toolbars. Perform a second scan using a different virus program, SpyHunter to name one. This is to ensure that there are no unrecognizable toolbars roaming around in your PC.